Signed ul: "Wm. T. Trego"
This is Trego's third version of Hannah. The painting is in the original frame with clef lines, musical notes and words of the song based on Lucy Larcom’s poem inscribed by the artist. Trego was awarded a second-prize Silver Medal for the work by the American Art Society of Philadelphia at their first annual exhibition in 1902. There is an American Art Society “Silver Medal” label on frame. 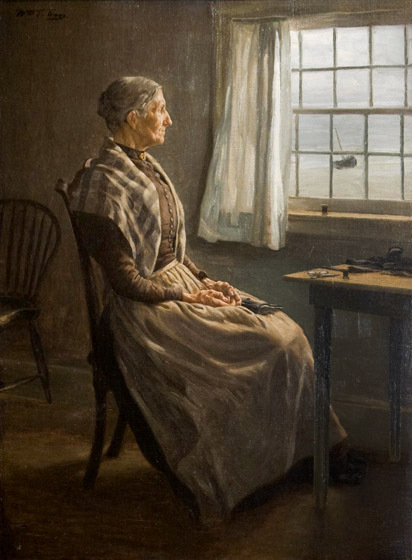 While the figure of Hannah is identical in every detail to the figure in the second version, the bed behind Hannah has disappeared and the large window with its shelf above and cluttered sill below has been replaced with a much smaller window and a small worktable. Very little of the room can be seen, and the focus is more on the lonely figure than her environment. A photo of the artist taken in his studio in 1901 shows this painting on his easel. A Treasury of American Art: Selections from the Collection of the Museum of Arts and Sciences (Daytona Beach, FL: Museum of Arts and Sciences, 2003), p. 217. A Treasury of American Art: Selections from the Collection of the Museum of Arts and Sciences (Daytona Beach, FL: Museum of Arts and Sciences, 2003).